New Ravenna, America’s premier designer and manufacturer of mosaics for both residential and commercial installations, introduces 12 new Delft mosaic designs to their Sea Glass™ Collection. Inspired by early 17th century Dutch porcelain, the mosaics are hand crafted using four different colors of blue and white glass. The background is Opal Sea Glass™, and the distinctive iconography is a combination of three colors of jewel glass: Lapis Lazuli, Iolite, and Covelite. Each piece of glass is cut and shaped by hand and arranged to create a mosaic interpretation of the decorative motifs found in traditional Dutch delftware as well as the marine life native to the Eastern Shore of Virginia, where New Ravenna is located. Shown as 8″ x 8″ designs, the square mosaics can be assembled in any combination and sized to suit any vertical area for residential or commercial projects. Additionally, New Ravenna can customize the designs to reflect family themes, from cherished pets to garden flora. 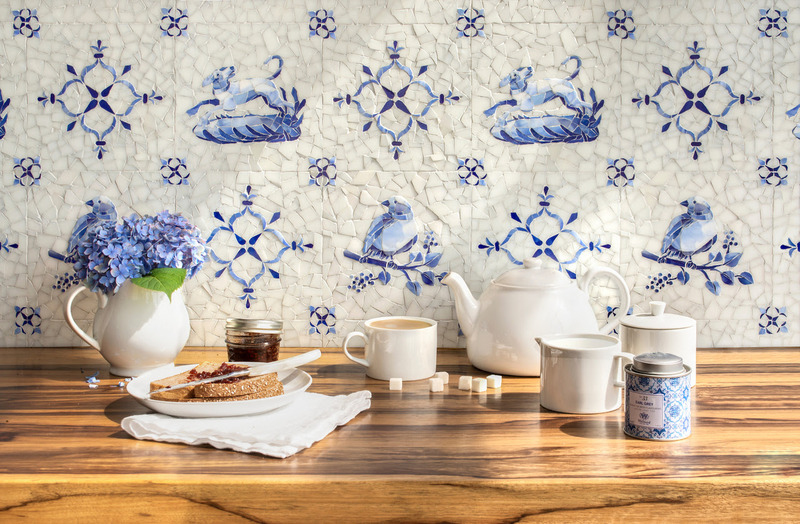 The Delft mosaics can be installed on walls, indoors or out. The Delft mosaics and all other New Ravenna products are available at New Ravenna showrooms throughout the United States, Canada, Europe, Russia, and Dubai.